You know No Frills grocery store? It really is a “no frills” type of store, but it offers the best deals right? That’s basically what Pinnacle Sportsbook is – the “No Frills” of online sportsbooks that serve Canada. There’s no fancy design, no crazy stat display – heck they don’t even offer a signup bonus or a free bet bonus. Their customer service is limited to e-mail, as opposed to telephone or live chat support. Really – go look at http://www.PinnacleSports.com right now and see what I mean. Not just for NHL – although they do offer the best NHL betting odds – but for every sport there is. Consistently, Pinnacle Sports are offering the best betting odds around. You’ll practically never see a sportsbook that offers better odds than Pinnacle. So if you’re looking for a “no frills” type of site that accommodates the serious better – they offer the highest betting limits too – then your best option is Pinnacle Sports, and it isn’t even close. Pinnacle are currently allowing Canadians to bet on the Stanley Cup Winners. We can also bet on the Western Conference Winner, the Eastern Conference Winner, and all Division Winners. As mentioned above, Pinnacle Sports offer the best odds bar none. For the ultimate fun, check out the betting odds offered at your local corner store – whether it is Pro-line, Sport Select or whatever – then compare them to Pinnacles betting options. The difference will seriously amaze you. If you’re looking to bet big money then Pinnacle also offers some of the highest betting limits online, and offer you a wide variety of currencies to choose from including the Canadian dollar. Another great feature with signing up with Pinnacle Sports is Dynamic Lines. You get some amazing insight into what other people are betting, so you can see what hockey betting trends there are which may help you make a decision. Pinnacle Sports also offer a mobile sportsbook so you can bet with your iPod, Android or Blackberry. Rather than offer separate apps for the iPhone or Galaxy S3 they offer one big catch-all mobile website instead. This is a very user-friendly, touch-screen compatible mobile website which is “no frills” as expected, allowing you to bet faster. Finally – deposit options. Pinnacle accept Mastercard, and Visa, as well as direct bank transfers. You can also use Skrill – which is like a third party between your bank and gambling sites – to deposit, which is our #1 recommended online processor for Canadians. So remember – first impressions don’t count. Compare the NHL odds at Pinnacle Sportsbook and you’ll see what I mean. There are many reasons to bet NHL at Pinnacle Sports – but there are of course reasons to consider as to why you SHOULDN’T bet at Pinnacle Sports. First of all the obvious one – lack of frills. It’s 2013 – pretty sites can be nice to look at. Plus having all the stats and previews in one place is handy too. Then there’s the lack of bonuses – hey it’s great to get the best odds long-term, but in the short-term it’s nice to be able to work on getting a bonus or using up some free bets to try the sportsbook out. No mobile betting bonus is disappointing – there are many sportsbooks, such as Bet365, who will give players a free mobile betting bonus. E-mail only customer service isn’t great either. While I understand that their goal is to keep costs and overhead as low as possible so they can give back to us punters in terms of odds – it’s still nice now and again to know that you can call someone immediately if there is a problem, such as if you made the wrong bet. However on the bright side their e-mail support is GREAT – and they also are on Twitter – although e-mail support is best for super fast responses. Pinnacle Sports also only offer the odds displayed in Decimal Odds or American Odds. Fractional odds are not available. 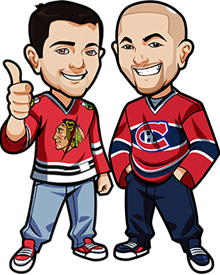 If you’re a serious better, then Pinnacle is the best option for you with their great NHL betting odds, their reduced juice NHL odds and their “no frills” approach to things. Click here to sign up. If you’re a casual or beginner better who is looking at building their bankroll via sportsbook bonuses and free bets, then you may be better off signing up at Bet365 – read more about Bet365 in our Bet365 Review.